Pre-crime aims to pre-empt ‘would-be-criminals’ and predict future crime. Although the term is borrowed from science ﬁction, the drive to predict and pre-empt crime is a present-day reality. This book critically explores this major twenty-first century development in crime and justice. 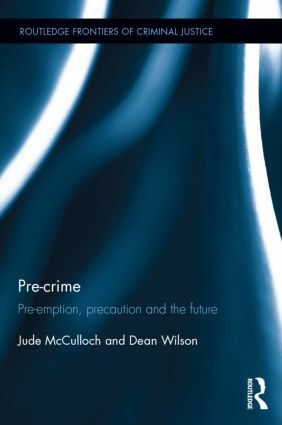 Drawing on literature from criminology, law, international relations, security and globalization studies, this book sets out a coherent framework for the continued study of pre-crime and addresses key issues such as terminology, its links to past practises, its likely future trajectories and its impact on security, crime and justice. It is essential reading for academics and students in security studies, criminology, counter-terrorism, surveillance, policing and law, as well as practitioners and professionals in these fields. 'This is an authoritative, critical and wide-ranging account of the emergence of pre-crime. It is elegantly written, accessible and historically nuanced, taking the reader through a fascinating journey from the past, to the present and, thereafter, into the future. 1. Introduction: pre-crime: pre-emption, precaution and the future 2. Before pre-crime 3. Risking the future: pre-emption, precaution and uncertainty 4. Pre-empting justice: pre-crime, precaution and counterterrorism 5. Pre-crime science, technology and surveillance 6. Evidence to intelligence: justice through the crystal ball 7. Creating terror: pre-crime, undercover agents and informants 8. Pre-crime: securing a just future. Jude McCulloch is Professor of Criminology at Monash University. Her research focuses on the growing integration of crime and war and the impacts of this on justice, politics and society. Jude is on the editorial and advisory boards of leading national and international criminology and interdisciplinary journals. Her research spans counter terrorism laws and policing, police use of force and (in)security politics. She has published widely in scholarly journals as well as in the media and magazines. Jude's books include Blue Army: Paramilitary Policing in Australia, State Crime and Resistance (eds. Elizabeth Stanley and Jude McCulloch) and Borders and Crime (eds. Jude McCulloch and Sharon Pickering). Dean Wilson is Professor of Criminology, School of Law, Politics and Sociology, University of Sussex, UK. He has published widely in the areas of surveillance, border control, technology and security and the history of policing and criminal justice. He is a Director of the international Surveillance Studies Network and an Associate Editor of the journal Surveillance & Society.